undertook an attempt to row the Atlantic on TW2 Route in team Row4Ocean from Dakar, Senegal to Paramaribo, Suriname on board a trimaran Year of Zayed. has undertaken an attempt to row the Atlantic E-W solo from Gran Canaria to St Barts onboard pure class Amigo in aim to become the oldest female (60) and the first Irish woman to row any ocean solo. The current record of the oldest solo female oceanrower is 55 years 135 days, it has been held by Diana Hoff (the 2nd woman to row any ocean solo) for already 18 years - since 2000.
made an attempt to row solo across the Atlantic W-E from the USA to Britain (preferably Lochinver, North West Scotland) in a self-built, clinker style skiff converted for ocean rowing - Sleipnir ( 8 legged horse). On June 3rd was towed to Barnegat Light due to adverse weather . On September 22, 2018 the row was over. a Team of Four Indian Ocean Row 18 (IOR18) have rowed the Indian Ocean E-W from Geraldton, WA. to Mauritius on board No Great Shakes to set a speed record for an open-class Four. Current speed record for Classic Four, set by Tiny Dancer in 2014 is 71 days 14h 51min, av. speed 2.07 knots. IOR18 is the 500th team to successfully row across an ocean ! have completed their row of the Arctic Ocean Open Waters from Torsvag, Norway to Svalvard as a part of their human powered expedition, which included a run from London to Dover, a swim across the English Channel, a cycle from Calais, kayaking across the Baltic, paddleboarding from Denmark to Sweden, kayaking Norwegian fjord and finally a row from Tromso to Longyearbyen, Svalbard on board Lady Susan. After the row from Norway to Svalbard, from Ersfjordbotn, Norway to Barentsburg, on board ocean rowboat Albedo in 2017, resumed and completed their row around the islands of archipelago Svalbard. has completed his solo row across the North Atlantic west to east route 'From Canada' - from St.John's, Newfoundland to Scilly Isles, UK on board a purpose-built open-class boat Lucille. Norwegian adventurers (winners of the First Race to South Pole 2008/099) have rowed the Atlantic W-E from New York, USA to England, retracing the route of Harbo&Samuelsen, on board a purpose-built boat. It is with great sadness that we announce the passing of Ole Elmer. Ole rowed the Atlantic E-W twice, once in 2010 and then again in 2011. Rowing two oceans would have been more than enough for most people - however Ole decided to make two further attempts in late 2011 and 2013. The contribution that Ole made to the sport however is far greater than simply rowing across the Atlantic. He commissioned the construction of a number of Ocean Rowing Boats including two new designs, but above all he brought his smile, generosity and huge enthusiasm to so many fellow ocean rowers. Our thoughts go out to all of Ole’s friends and family at this time. has embarked on a challenge to complete a solo row across the Atlantic W-E from New York area to Britain (preferably Lochinver, North West Scotland), in a self-built, clinker style skiff converted for ocean rowing - Sleipnir ( 8 legged horse). The re-start date t.b.a. when the situation with the boat and the weather becomes clear. Team of Four on board Saga have restarted their row (started in Team of Six) of the Atlantic E-W from Portimao, Portugal to Florida, USA via Cuba to become the first team to row from Europe to Cuba and North America. has completed her row across the Atlantic E-W solo from Gran Canaria, Canary Islands to Barbados onboard speed record holder open class boat Soma (Charlie Pitcher, UK. 2013) to break a solo speed record for women in an open class (Elaine Hopley, 2016/17 - 59 d 19hrs 14 min). The record for female solo pure-class (Anne Quemere, France. 2002/2003) is 56 days, 13hrs 09min. on a World Speed Record in an open class female solo ! Team Ocean Brothers, coordinated by Leven Brown, have rowed the Atlantic East to West from Gran Canaria to Barbados in memory of Peter, Jude’s father and Greg’s stepfather and to raise funds for the British Skin Foundation. The youngest ocean rower to row any ocean in a Pair ! Team of Six on board Saga made an attempt to row the Atlantic E-W from Portimao, Portugal to Florida, USA via Cuba to become the first team to row from Europe to Cuba and North America. Two crew members - Alex Dumbrava and Edmund Berg - had to leave the project. 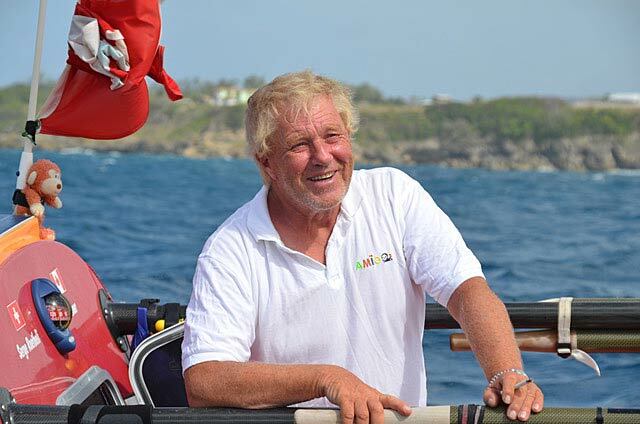 has completed the row across the Atlantic E-W solo from Canary Islands to Barbados. He was 66 at the start, so he decided he needed "an epic adventure before it's too late". He's made it ! has successfully crossed the Atlantic E-W from El Hierro to Martinique sculling with a single oar moved over the stern. Team of Five have rowed the Atlantic E-W from Europe, Portugal to South America, French Guyana on board Rannoch 45 Rose skippered by Ralph Tuijn. After being hit by a storm on Dec 16th, some of the boat’s equipment has suffered significant damage, so the skipper and crew have decided to make a stop in the Canaries to assess and repair under shelter. a former Royal Marines Commando has undertaken an attempt to row the Atlantic E-W solo on board Wallace from Portugal to Venezuela, to become the fastest solo on this route and to raise money for the JWF and R2R charities. two brothers have rowed the Atlantic E-W from Gran Canaria to Barbados on board White Dwarf in an attempt to become the youngest team (22 & 19) and the youngest siblings to row any ocean. The race is over on February 15, 2018, with the arrival of the last participant - Damian Brown.